This song is referenced by Song 390 – Nelson Cabin and is about our first Science Camp not in Cedar City. 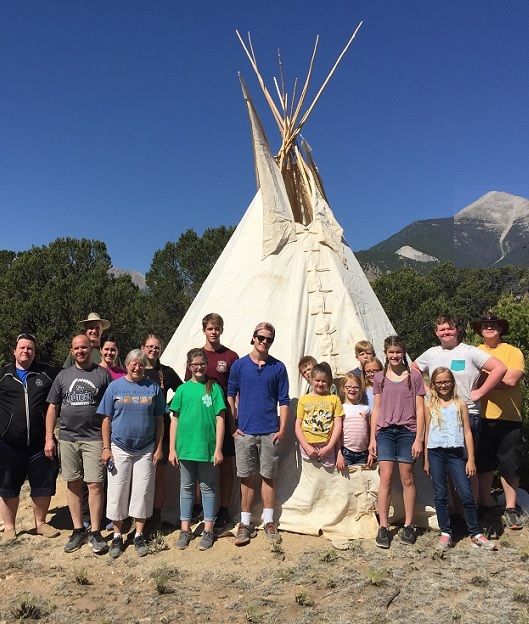 It was actually our 10th Science Camp and was held in Buena Vista, Colorado, where my friend Scott Bowman and his wife Maria have a beautiful cabin. This cabin sits on detritus eroded from the mountains to the west (see Song 386 – Erosion). Scott thinks a lot of the detrital material came from glaciation. There are obviously large faults (see Song 397 – Faults) between the large 14,000+ foot mountains to the west of Scott and Maria’s cabin. Chorus 1 refers to these mountains: “Antero, Princeton, Yale, and Harvard, Looking down on me, As I do my morning Tai Chi, Looking across the beautiful valley.” Verse 1 states “Scott and Maria Bowman, Are living the dream, A medieval Mansion, On 40 acres to be seen.” Chorus 2 repeats the first 2 lines of Chorus 1, and adds “As we cook pancakes, Which strong bodies make.” Verse 2 states “Eighteen came to Science Camp, The first four days of July 2018, An annual family togetherness lamp, It’s wonderful Grandkids still are keen.” The last 2 lines of Chorus 3 are “As we pack our garbage in the car, Because we don’t want to carry it that far.” Verse 3 sates “The Fourth of July Parade, In Buena Vista, Colorado, Then Dallin did more than wade, In the dunking pond-o.” Then the last 2 lines of Chorus 4 are “As I watch last year’s youngest, Avalyn, bond with a new friend.” Verse 4 states “Izzy and Avalyn could not be separated, As they wanted to be in the same car, While everyone also waited, To go to the continental divide far.” The last 2 lines of Chorus 5 are “The oldest three slept in the tree house, While everyone else was in tents.” Verse 5 states “Quinton rolled all over his space, He was even sitting up asleep, Looking at each bug, it was not a race, Eating 3 pancakes was a big leap.” The last 2 lines of Chorus 6 are “Melanie wanted to be with the crew, Watching how all the kids grew.” Verse 6 states “Kendall was a trooper, Acting older than her age, There was not a blooper, Pulling her own tooth out of its cage.” And Chorus 7 says “Antero, Princeton, Yale, and Harvard, Looking down on me, As I watch my Grandkids grow, In the beautiful valley.” The image to the left shows all of us in front of the teepee we put up the second time around, with Mount Antero in the background. The extended image is a panorama view showing a couple of the mountains.